How many times have you spent hours on a beautifully decorated cupcake perfect for your event only to look down at the baking cup just to be let down? It happens to me every time. Baking cups can be downright ugly at times, especially when you bake with a dark batter. They just can't stand up to the oils in the cake batter. It's like they become see through. Cupcake wrappers are great idea to make them perfect! Cupcake wrappers are a great way to turn an everyday cupcake into an awesome party cupcake. 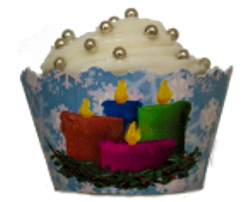 They are a paper wrap that wraps around the already baked cupcake. Take a plain cupcake and match it to anything from 1st birthday with the number 1 all over the wrap to elegant white wedding very easy. You can buy wrappers online, print your own with digital templates, use printed templates as a pattern, cut them from lace paper doilies, and even The Circuit Cutter has a cartridge. To print your own you can use a digital template and almost any photo editing software to add in designs. Use digital clip art or colors to add to the wrapper. To cut your own out of fancy paper or scrapbook paper use that same template printed out as a pattern. Trace your pattern onto the paper of your choice and cut out your wrapper. With all the great choices in paper it will be easy to match your event. To cut a wrapper out of a 10 inch circle paper lace doily, use a printed template and cut it out from the lace edge. The circle of the doily is perfect curve for the wrapper. The Circuit cutting system also has cartridges to cut out cupcake wrappers for you. You could get great inner design cuts this way. It can't get any easier than that. If DIY isn't for you there are thousands of pre-cut designs ready to be bought. They can be found at most of your party supply stores or from tons of online stores. There are all kinds of designs to match your event. You can have the best cupcakes on the block thanks to one of the many options for cupcake wrappers by either buying or making them yourself. No more settling for ugly baking cups for your beautifully decorated cupcakes. Now your cupcakes can be beautiful from top to bottom for any event. Cupcake wrappers are the icing on the cake!! Make sure to visit my blog The Cake Class for helpful tips and a quick cupcake wrapper and much more!